| Don't just watch. React. Philip Resnik, Amber Boydstun, Rebecca Glazier, and Matthew Pietryka, “Scalable Multidimensional Response Measurement using a Mobile Platform”, In Political Communication in Real Time, eds. Dan Schill, Rita Kirk, and Amy Jasperson, Routledge, 2016. 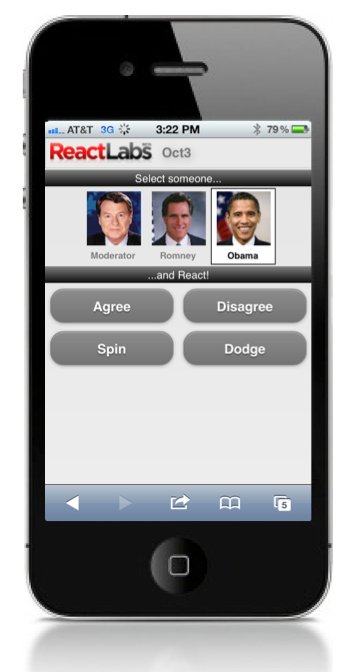 The React Labs project developed a new platform for real-time polling — a mobile app that let users react to what they’re watching moment by moment, giving them a greater sense of engagement with what they’re watching, while simultaneously collecting temporally fine-grained, interpretable data about their responses. Traditional polling provides interpretable data, but it can’t give you second-by-second information about people’s reactions and it doesn’t scale. Twitter analysis gets you (closer to) real time on a massive scale, but it’s wildly messy and it doesn’t let you choose the questions you want answered. Dial testing provides instantaneous reactions, but it’s small scale and expensive, and it only gives you one dimension of response. React Labs’ technology brought together the best features of all these approaches. React Labs was proud to be a recipient of support from the Maryland Technology Development Corporation under the Maryland Innovation Initiative.